This is your brain on English. As part of our continuing study of poetry, you will be keeping a journal of annotated poems and your commentary. Completing the journal tasks will help you with your facility and understanding of poetry as a genre and should aid in your reading and writing about poetry in preparation for both class assignments and the AP exam. Each chapter of Sound and Sense is structured in the same way. The opening part of the chapter contains an explanation of the aspect of poetry being studied, with a small number of poems to illustrate the aspect (usually 2-4). A number of poems are included after the explanation for additional study. These are delineated in the table of contents by a line separating the parts of the chapter. You will be preparing three journal entries for each chapter. Each entry should be assembled in the journal the same way. 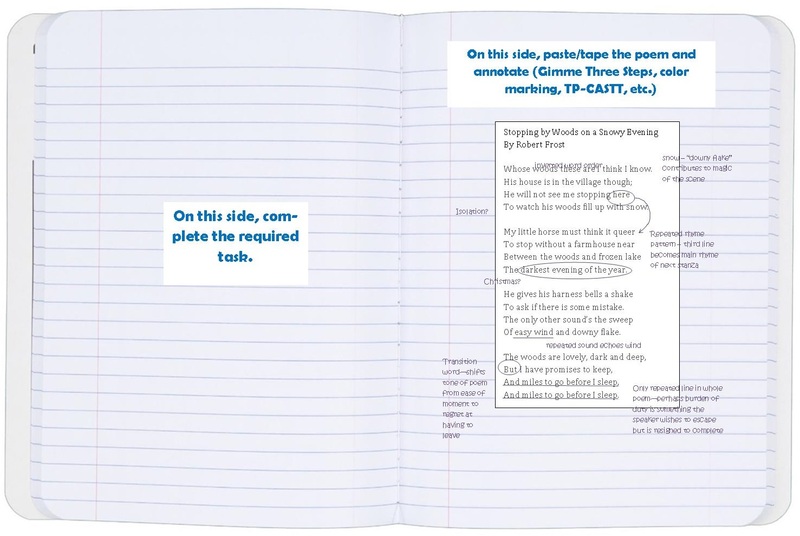 On a right-hand page, tape or glue a copy of the poem. I suggest you search for the poem and print a copy rather than hand-copying, especially if the poem is lengthy. Be sure to leave some space around the poem for annotation. 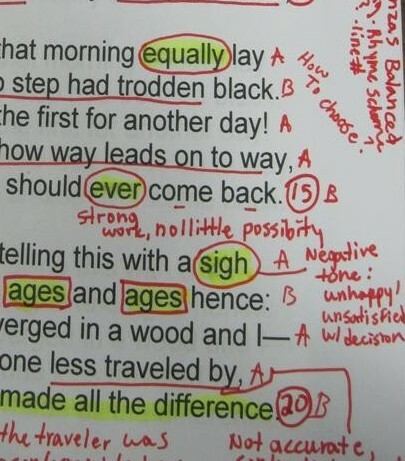 Annotation methods vary from student to student, but the goal of any method should be increased depth of thinking about the poem. The TPCASTT and Color Marking methods you have pasted into the inside front cover of the journal can guide your thinking. Instructions on both may also be found here. On the corresponding left-hand page, you will be completing a task. This task will differ depending on which section of the chapter you are working with. Read the entire explanatory section of the chapter, including all of the poems used in the explanation. Select one poem of at least ten lines in the section for your journal entry. Complete your annotation. On the left-hand page, answer the questions provided in the chapter for your selected poem. Select one poem of at least ten lines from the section for additional study. Annotate the poem carefully. On the left-hand side, complete the Gimme Three Steps method pasted into the inside back cover of your journal. List any appropriate notes you need, drawing conclusions about overall patterns rather than listing all details, and create a two-step thesis as directed. Select a second poem of at least ten lines from the section for additional study. Annotate the poem carefully. On the left-hand side, write a thoughtful reaction to the poem. What do you notice about it? What makes it interesting? Pleasing? Challenging? What overall impression do you have about what this poem is trying to communicate? Refer to specific quotations in the poem where appropriate. Your careful journal work will help you with poetry analysis and writing questions in both the multiple choice and free response sections of the AP exam. Try to vary the types and styles of poems you select; think about period, form, style, etc. as you choose. We will be focusing on a chapter in Sound and Sense about every two weeks. Please label all pages of your journal entry with the chapter number for reference. You should bring your copy of Sound and Sense and your prepared journal to class that day for checkoff.